It’s the town from Lord of the Rings and The Hobbit. 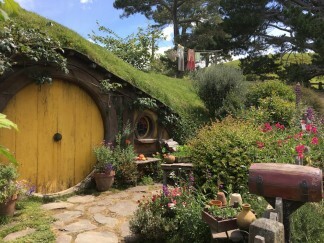 Frodo Baggins and Bilbo Baggins house has a large tree on top of its “roof” but it’s not real! It is made of metal and took two years to make, as its leaves are hand-made. 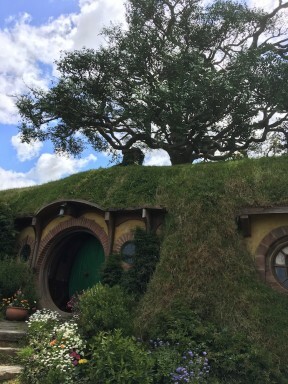 It makes perfect sense for an un-natural, natural town, to have a tree that does not grow, have annoying roots or shed its leaves on the town’s main dwelling, Bag End. Mind you, there was produce and wares on show I front some of the hobbits dwellings. Well they were looking real, but unreal as well. They did have their washing on the line, but no sign of these Hobbits. Now, at the Green Dragon they did have real ale and cider, and real flames in a real fireplace to warm my bones. 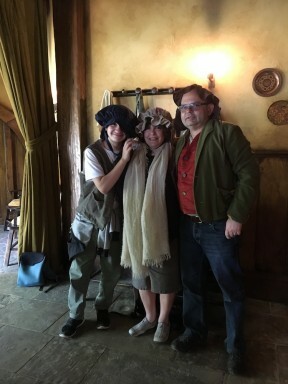 At last we finally did meet a family of hobbits at the Dragon. 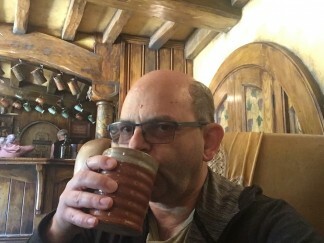 I did find out that Hobbiton had no dentist. Well this could be an opportunity to open up a branch practice here, unopposed. 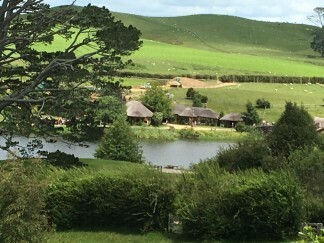 Seymour Dental @ Hobbiton. I will have to find a place where I won’t knock my head on the ceiling and brush up on my hobbit anatomy and dentate. (Sorry, bad joke). Before I settle in, I wouldn’t mind finding a certain ring for myself.